Batiks are the way to go for this quilt. The turquoises and golds are so pretty together in this pattern. 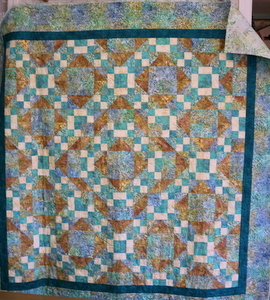 Quilt measures 69″ square. The pattern that is made with these fabrics is interesting and very pretty. This quilt is a 4 week class offering.